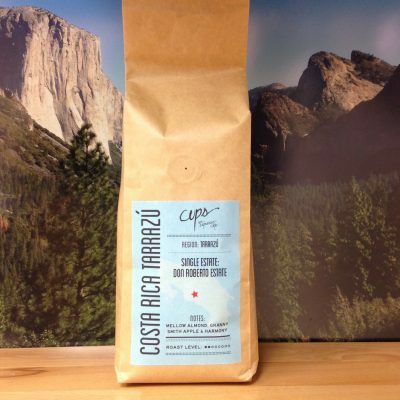 A well balanced Costa Rica Tarrazu from Cups Espresso Cafe in Jackson, MS. We called it - Balanced, Nutty, and Mellow. Fruit-like aromas showed in the cupping, enhanced by dark caramel, fig, and chocolate. The body is medium in weight and gentle on the palate. A delicate malic acidity is present and highlighted by hints of orange. Sweetness is medium with dark chocolate and caramel. Nutty complexity shows distinctly, with almond and cacao lasting well into the finish. We smelled fruity sweet aromas after pouring. Our brew was light in body and reminiscent of black tea in texture. A low-toned, soft acidity keeps from overwhelming your senses. Sweetness is in balance, and earthy, nutty complexity rounds out each sip. In 3 words, we call this coffee - Balanced, Nutty, and Mellow. Categories: Coffee Ratings. Origins: Costa Rica. Flavors: Almond, Cacao, Dark Chocolate, and Nuts. Brew Descriptors: Balanced, Mellow, and Nutty. Roasters: Cups Espresso Cafe.